Several shoe owners think that the design of the Air Jordan 2 Retro Decon is neat. According to some sneaker collectors, the suede upper of the shoe model feels premium. A good number of reviewers are happy with the traction pattern of the shoe. They appreciate how it grips court floors well. Some users love using the AJ 2 Retro Decon because they get so much comfort from the Air Sole unit. There are a few women who rocked the signature shoe and looked great in them. A couple of wearers mention that the traction pattern of the Air Jordan 2 Retro Decon does not cause slippage. The signature shoe runs true to the reported size. Many wearers claim that buying Air Jordan Retros, especially these Decons, is not worth the hype. They’d rather spend $160, or even less, for an actual basketball shoe. A handful of wearers mention that the single-hue colorways of the shoe are an aesthetic overkill. A few users went half a size down because the toe box area is roomy and causes their foot to slide. The suede upper gets dirty easily, observe at least two reviewers. A small number of shoe owners say the rear panel of the shoe is too thin. For Michael Jordan fans who are fine with spending $160 for a lifestyle shoe, the Air Jordan 2 Retro Decon is going to be a good addition to their AJ collections. These expensive shoes are great for casual use. As for those who would love to cop a pair but think that the price is over the top, they can wait a little bit for a price drop. 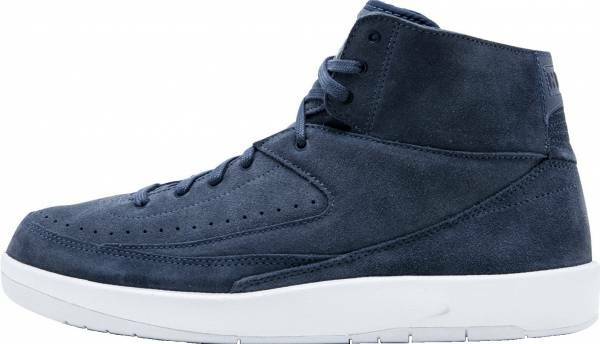 Overall, the Air Jordan 2 Retro Decon is a fashionable and casual basketball-inspired shoe. The quality on this is fire! The Air Jordan 2 Retro Decon is a lifestyle remake of the original shoe model using premium materials. The excess padding in the tongue and inside of the shoe is removed for a much slimmer and lighter fit. It features a color-blocked appearance. The signature shoe was dropped on May 24, 2017 at $160. The upper is wrapped with comfortable suede. There is a line of perforations tracing the midfoot area for breathability. The durable outsole is made of a rubber compound that ensures an outstanding grip on any surface. Adding to the sophisticated look are the waxed shoelaces. As for cushioning, this retro shoe comes with Air Sole units for a lightweight and bouncy ride. Michael Jordan’s signature shoes are normally released time and time again and in different uppers and renditions. The first high-top Air Jordan shoes and the 11th Michael Jordan signature sneakers are the most retroed in his line. Cushion. The responsiveness and comfort of the Air Jordan 2 Retro Decon come from the Air Sole units in the midsole. These bags compress to absorb impact and then spring back to its original shape for the much needed energy return. Traction. The traction pattern on the Air Jordan 2 Retro Decon is a combination of lines, circles, and rectangles. It provides great court grip, and it effectively prevents court slippage. Length and Width. The Air Jordan 2 Retro comes in the standard width and length. Most shoe owners with average-sized feet agree that the shoe is true to size. However, it is still recommended for new buyers to fit the sneaker in the nearest shoe outlet before purchasing. Lockdown. The Air Jordan 2 Retro Decon has a modern style with its cut and monochromatic colorways. However, it does not swerve from the traditional lacing system. The thick and waxed shoelaces and the tongue can be adjusted for a comfortable fit all day long. The upper of the Air Jordan 2 Retro Decon is made of suede with beautiful and clean stitches. Perforations line the midfoot area and the tongue for ventilation. The super stylish Air Jordan 2 Retro Decon has a high-top silhouette. The more formal wearers tend to tie the shoelaces up to the topmost eyelet. They pair this model with short sleeve or long sleeve button-down shirts and khaki pants or jeans. As for those who go for a street or hip hop style, they let the shoelaces loose and wear them with baggy pants. One wearer paired the Air Jordan 2 Retro Decon with jogger pants and loose shoelaces. Another young wearer wore skinny, dark blue jeans and folded the ends of the pants to showcase the shoe. The “JORDAN” callout is located on the outsole. The prestigious “NIKE” callout is displayed on the ankle. The top of the tongue has an “AIR JORDAN” callout on top of a winged ball logo. As for the Jumpman logo, it is found on the insole. For such an enjoyable and decent shoe to wear, the Air Jordan 2 Retro Decon comes in different colorways. Though these shoes are designed for men, women who can get the right fit are able to rock these fun hues. Mineral Gold. The Mineral Gold colorway is available only in 6 stores. This is a light mustard pair that easily commands attention. Bordeaux. The Bordeaux colorway is a dark and brownish pair. It is a limited release as well. Mint Foam. The Mint Foam colorway is a limited release. It is an entirely mint green shoe. Thunder Blue. The Thunder Blue colorway has a blue upper with a white midsole and outsole. This is the only colorway of the Air Jordan 2 Retro Decon where the color of the upper differs from that of the midsole and outsole. Luxury Deconstructed. The Luxury Deconstructed colorway is also called the Triple Black or All Black Air Jordan 2 Retro Decon. Sail. The Sail colorway is a light beige or cream pair with a vachetta tan leather at the top of the tongue and the ankle.